Ramlila Maidan also Ramlila Ground is a large ground located in New Delhi, India, traditionally used for staging the annual Ramlila. It is used for religious festivals, major political rallies and meetings, and entertainment events. It is located near New Delhi Railway Station and Delhi Gate. The Ramilila Maidan was originally a large pond before 1930. It was filled up in the early 1930s so that annual Ramlila, held in October, could be shifted here from the reti (sandy) floodplains of Yamuna River behind the Red Fort, where Hindu soldiers of the Mughal army first started staging the Ramila in the 1800s. 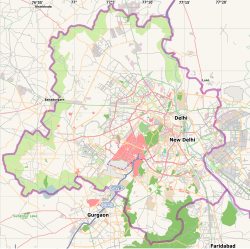 Geographically the ground falls between the Old Delhi and the New Delhi. The historic Turkman Gate of the Old city stands nearby, and the ground stretches between Aruna Asaf Ali Marg and Jawaharlal Nehru Road. It quickly became a popular site for political meetings, with Mahatma Gandhi, Jawaharlal Nehru, Sardar Patel and other top nationalist leaders addressing rallies here. A small pond is still there inside the Ramlila ground as a remembrance of its history. In 1961, then prime minister Jawaharlal Nehru held a public gathering welcoming Queen Elizabeth II during her state visit to India. On Republic Day, 1963 after India's defeat in Indo-China war, Lata Mangeshkar sang the patriotic song, "Aye Mere Watan Ke Logo" in the presence of Nehru. Two years later in 1965, at public gathering here, then prime minister Lal Bahadur Shastri gave his slogan Jai Jawan Jai Kisan. Jayaprakash Narayan along with prominent Opposition leaders, addressed a mammoth rally with over a lakh people participating on 25 June 1975. This was the first protest in Ramlila Maidan, which was against Indira Gandhi's government. This was Jayaprakash Narayan last rally before he was arrested. Just after Emergency situation was removed in India, in February 1977, several anti-Congress(opposition) leaders came on a common platform to form Janata Party. The Joint rally was held at Ramlila and was led by several opposition leaders Jagjivan Ram, Morarji Desai, Atal Bihari Vajpayee, Charan Singh and Chandra Shekhar. Since Vajpayee had by then already acquired the reputation of a master orator, large crowds turned up to listen to him, as also the other speakers. The rally also a large number of Muslims had turned up to hear the Shahi Imam, Bukhari Senior, who had extended their backing to the Janata Party. The 2011 anti corruption demonstration of Anna Hazare and the 2013 as well as the 2015 oath ceremony of the Delhi chief minister Arvind Kejriwal also took place at the Ramlila Maidan. People Gathered at Ramlila maidan on Anna Hazare's Fast. Ramlila Maidan was also venue for Swami Ramdev for his indefinite hunger strike on 4 June 2011 to bring back the black money stashed in tax havens abroad, which saw 65,000 odd supporters. However, the event came to highlight when Delhi Police on 6 June along with a large police force lobbed tear gas shells, burned the place and lathicharge the crowd at 1 am (IST) to evict them. 2011 again saw anti-corruption protests in the month of August; this time from the activist Anna Hazare. Ramlila Maidan protests - Protests in June 2011 at Ramlila maidan. 2011 Indian anti-corruption movement - Protests in August 2011 at Ramlila maidan. ^ Philip Lutgendorf (1991). The Life of a Text: Performing the Rāmcaritmānas of Tulsidas. University of California Press. pp. 253–. ISBN 978-0-520-06690-8. ^ a b c d "The ground beneath her feet". Livemint. 5 April 2014. Retrieved 5 April 2014. ^ "Unforgettable songs of national fervour". =Hindustan Times. 14 August 2008. Retrieved 5 April 2014. ^ "Tryst with history and cries for freedom". Times of India. 18 August 2011. Retrieved 20 August 2011. ^ "Tryst with history". STAR News. 18 August 2011. Retrieved 20 August 2011. ^ "Ramlila Ground: Tryst with history and cries for freedom". The Economic Times. 18 August 2011. Retrieved 20 August 2011. ^ "Arvind Kejriwal to take Metro to reach Ramlila Maidan". DNA. 27 December 2013. Retrieved 29 December 2013. ^ "It's AAP ki Dilli: Arvind Kejriwal takes oath as Delhi chief minister at packed Ramlila Maidan". Hindustan Times. 14 February 2015. Retrieved 14 February 2015. ^ Indo-Asian News Service (4 June 2011). "Government agrees to my demands, but fast on: Ramdev". Manglorean Media. Retrieved 21 July 2011. ^ Press Trust of India (5 June 2011). "30 injured in police sweep at Ramlila Maidan". The Times of India. New Delhi. Retrieved 22 July 2011. ^ "Front seeks greater representation for Muslims". The Hindu. Chennai, India. 28 November 2011. This page was last edited on 29 September 2018, at 03:55 (UTC).